Here is a painting recently acquired by The Museum of Modern Art. 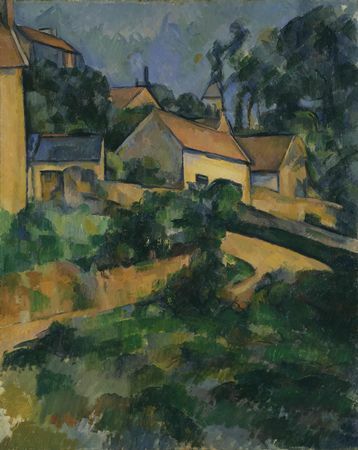 It was considered one of the few great canvases by Cézanne still in a private collection. It was given to the museum by Mr. and Mrs. John Hay Whitney along with six other masterpieces by van Gogh, Matisse, and Picasso. Some gift. Still, the painting is a bit difficult to understand. At first, the structure of space is straight-forward. As expected, there is a foreground (the green foliage at the bottom), a middleground (the road and houses) and an area of deep recession (the sky). Each of these zones are largely defined by color; green for the bushes in front, a warm ocher for the middle plane (road and houses), and blue for the sky. It is here that Cézanne begins to play tricks. 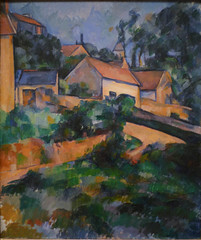 Having rejected clear linear or atmospheric perspective as a means of constructing recessionary illusion, Cézanne relies on the clues afforded by scale, overlapping, and color. Yet for all this, the space in Turning Road at Montgeroult seems awkward. Even as we see the three zones of space in relation to each other, the painting seems oddly flat, as if the sky were pulled forward and the foreground were pushed back. Of course we still see the illusion, but even as we see the space that Cézanne’s line insists upon, the painting looks too much like three flat planes resting atop each other and the painting begins to remind us that it is, in fact, a vertical curtain. 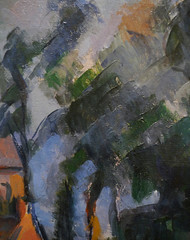 There are two means by which Cézanne has sabotaged the space of this canvas (unfortunately the effect is muted in reproduction and even more so on the computer screen–so trust me on this). The first is brushwork. In an Old Master landscape, the greatest detail and the most delicate brushwork exist in the foreground. The movements of the brush get broader and more generalized as space moves back. Here, however, the artist has treated the entire canvas with a consistent level of clarity, or lack there of, leveling the sense of near and far. Secondly, Cézanne has understood the potential of color, as opposed to chiaroscuro and linear perspective to structure or destabilize space. Have you noticed that in the middle of the sky, just to the left of the church steeple and the tree, there is a small smudge of brown paint. It is the same ocher used to render the shadows in the road and on the roofs. What is this? Have you ever seen a dense brown smudge just floating in the sky? I don’t think so. So what are we as the viewer to make of it? Is it a mistake? 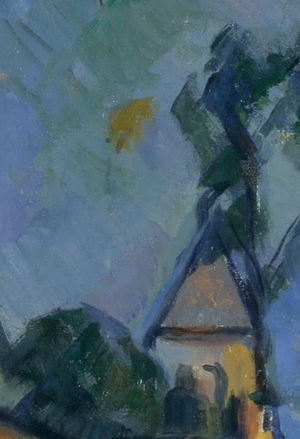 Was Cézanne a dottering old man by 1898, who accidentally hit the canvas as his arms flailed about and then was too lazy to wipe it out and repaint that section? No. So what is it then? Well, when you look at the ochre smudge, what happens to the deep space of the sky? Do you notice how the ochre smudge refuses to sit back in deep space but instead pushes forward toward the middle plane of the houses? When seen in person, the brown paint that hangs in the sky actually brings the sky with it, denying the illusion of deep space entirely. Also, note the bright sky blues in the foreground bushes. Just as the ochre spot in the sky forces the sky forward, so the clear blues that oddly appear within the viewer’s reach, punch holes in the solidity of the foreground. The brown in the back pushes forward and the blue in the front pushes back. The result is a flattening of space or perhaps a more honest expression of the true flatness of the canvas. Cite this page as: Dr. Steven Zucker and Dr. Beth Harris, "Paul Cézanne, Turning Road at Montgeroult," in Smarthistory, August 9, 2015, accessed April 23, 2019, https://smarthistory.org/cezanne-turning-road-at-montgeroult/.